The UKHammocks Woodsman X Single Hammock, simply put, is a gathered-end hammock with a zippered bug net. But it sets itself apart in the details. 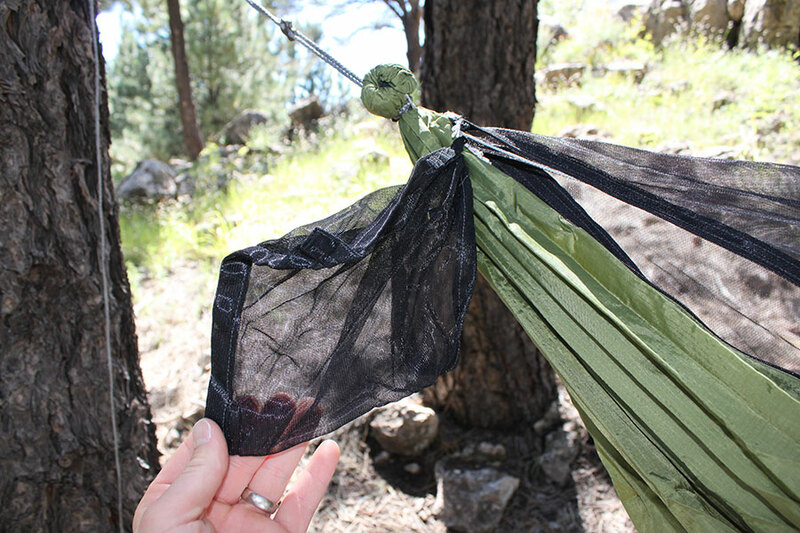 The hammock uses a tailored bug net to reduce material and weight while still including a full-length zipper that allows me to neatly remove the bug net and store it in a pouch at the end of the hammock. The Woodsman also features a unique foot box area with an adjustable tensioner to tweak the pocket space. The ends channels are cinched and tied and then the suspension is whipped around the “knots” formed at the ends. 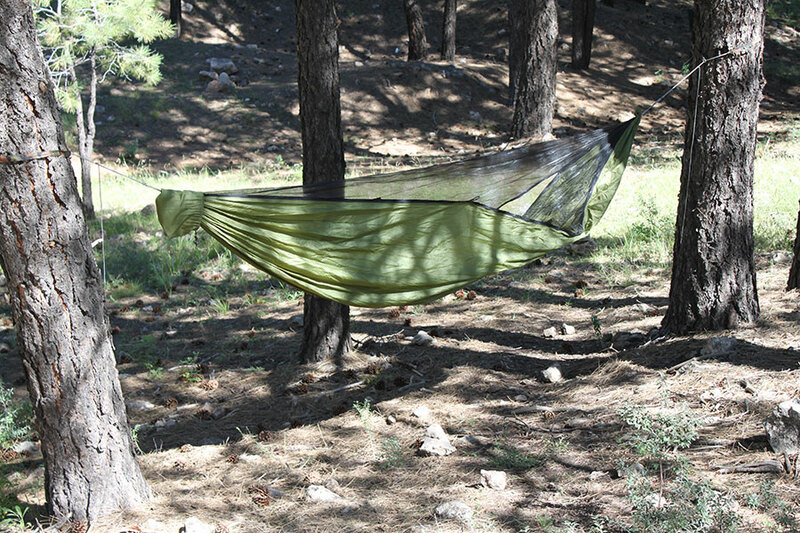 This whipping style, along with the foot box tensioner, provide a great lay in the hammock, but UKHammock’s has also tailored the bug net and hammock body fabric into a unique trapezoidal shape that contours to match the human body more than by just a mathematically-defined asymmetric pull-outs. And the extra material in the foot area creates just the right space for my feet, and the bug net tapers to fit. The ridgeline is set, and like other hammocks with tailored bug nets, is not adjustable because you could easily damage the bug netting. However, I found the length to be just perfect for the design. An organizer hangs from the ridgeline and completes the design. 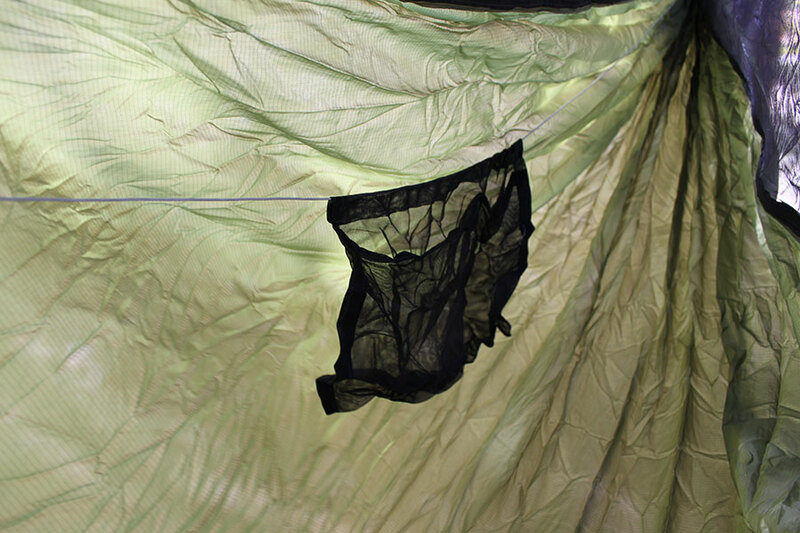 The zippered bug net makes the Woodsman X a very versatile hammock, but I’ve found that keeping the bug netting on works year-round, even when bugs aren’t a problem, to help shape the hammock on the sides as well as keep my gear from falling out when I’m not inside. The kit comes with appropriate webbing straps, whoopie sling suspension, and toggles, to tie up the fairly popular Marlinspike Hitch, but you can easily replace the suspension system with whatever works best for you. I took off the whoopie slings and installed continuous loops of Amsteel on the hammocks, which allows me to use nearly any suspension system available. I have been secretly hoarding this hammock for a few years now as one of my favorite bug net backpacking hammocks, primarily because it has one of the most comfortable, flat, and unrestricted lays compared with other sculpted bug net hammocks. 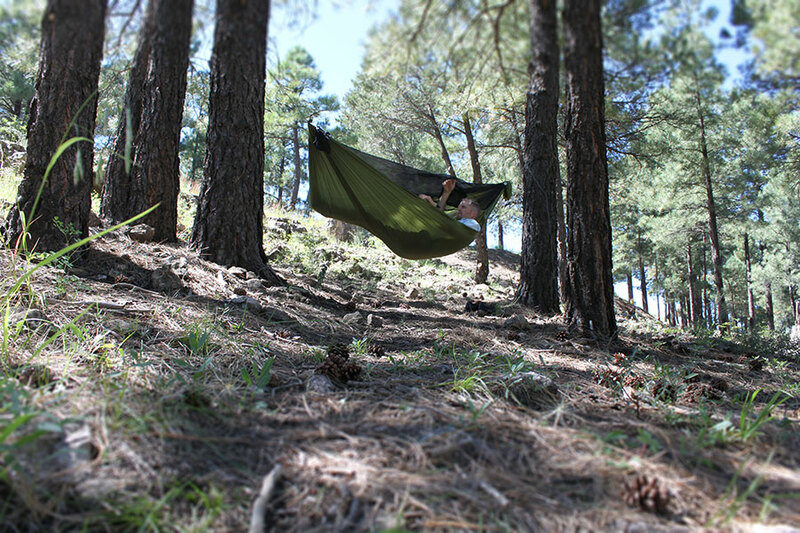 This hammock also packs down small, is light, and versatile enough to take on any camping trip. I love it. 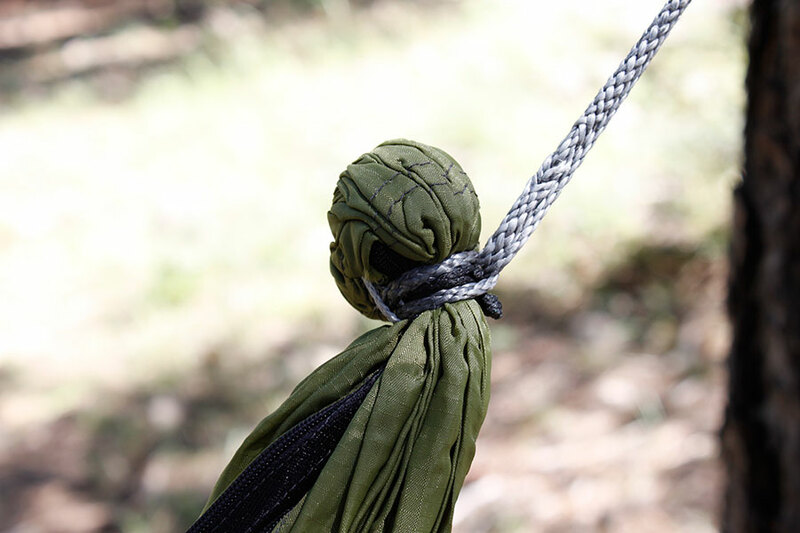 This image shows the foot end of the hammock. Notice that the “pull out” point is closer to the end of the hammock, pulling the extra fabric around at the feet instead of near the knee. The only piece missing from the kit would be an appropriate, matching rain fly, but it seems more common for hammock manufacturers now to sell the tarps separately. Weight limit 90 kg (198 lbs) and height 6’3″ (190 cm) tall. Great review of a great product. One pro tip, if you order a double layered model and want to be able to insert a pad between the layers, make sure to mention this otherwise Mat will seal the fabric all the way around. Thanks Tord, this is really useful. 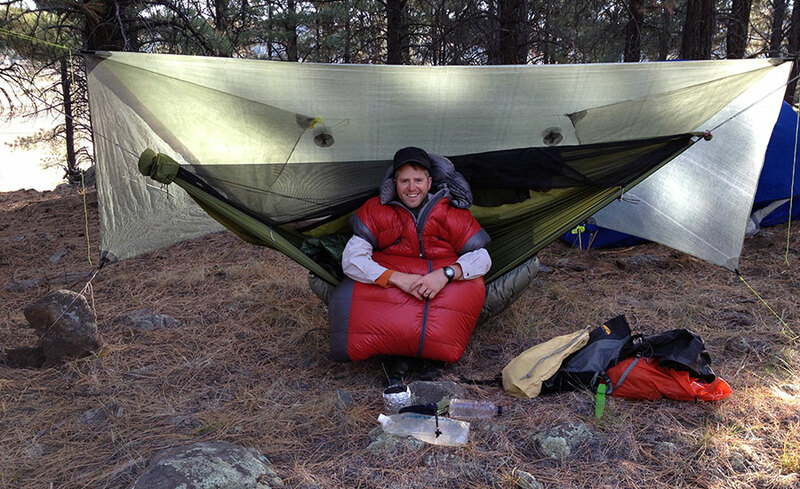 I would have guessed that all double-layer hammocks allow the user to slip in insulation between the fabric. Great review, Derek! I’m considering buying a Woodsman X DL, and this article was very helpful. Do you know exactly how long this hammock is? 118 inches or even longer? I believe it is a 10 ft (305 cm) long. How does this hammock compare with the WBBB? Looks fairly similar. I tend to be a side sleeper and wonder if this would be a better option? The footbox design is clearly different using different techniques but achieving similar results. The Woodsman X also has a removable bug net. 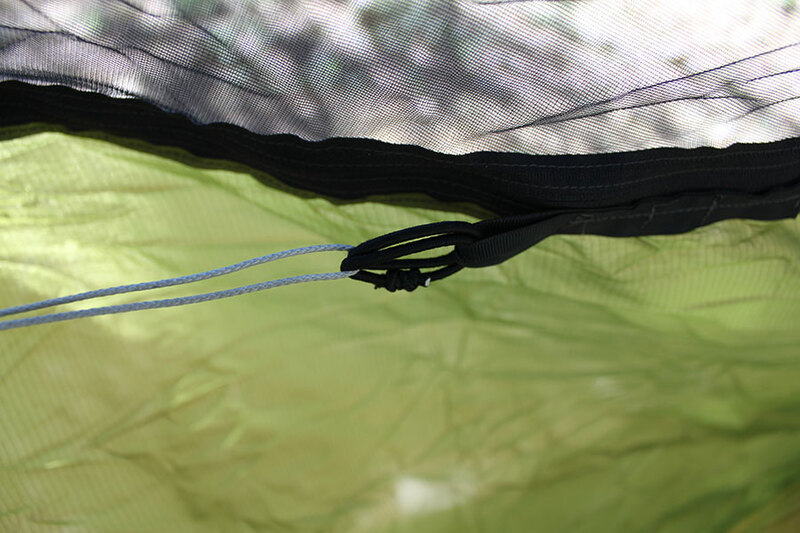 The Warbonnet Blackbird has perimeter tie-outs to pull out the sides of the hammock. A few other odds and ends. As for side-sleeping, I often sleep on my side and in a semi-fetal position in all the hammocks I own. I haven’t found one that is better or worse, necessarily. Gathered-end hammocks, with their low center of gravity, really help maintain a balance and prevent you from tipping, so side sleeping and tossing and turning are no problem. Sometimes it can feel like working around in a water bed, but it is doable. Nice review. I’m thinking about matching this hammock with a hammockgear standard tarp with doors. 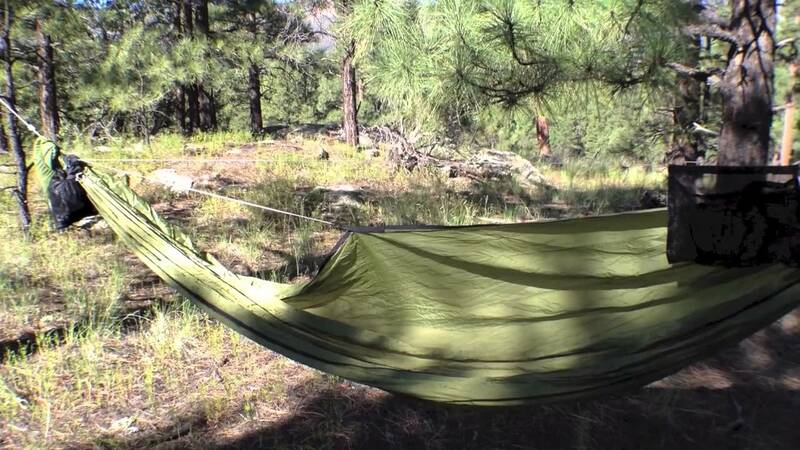 What tarp length would you recommend with this hammock? 11 ft standard is fine.